Exhibit runs from April 24 - July 22, 2017. QUILTING THE WILD WEST is an open invitation to all quilters and fiber artists to create a quilt commemorating Buffalo Bill Cody and the Wild West. Theme: Entries must be quilts that relate to the theme of Buffalo Bill: Quilting the Wild West. Western-themed quilts can include Buffalo Bill, cowboys, cowgirls, Native Americans, horses, cows, rodeo, gold mining, frontier architecture, Old West history, etc. are some things that could be included in the quilt. Techniques: Any technique - piecing, applique, embroidery, printing, whole cloth, painting, photo transfer may be used as long as it is done well and in good taste. Steve Friesen is the Executive Director of the Buffalo Bill Museum located at the top of Lookout Mountain. 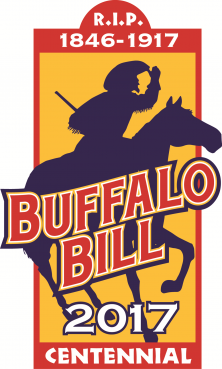 The Buffalo Bill Museum and Grave, owned and operated by the City and County of Denver, exists to preserve the memory of William F. “Buffalo Bill” Cody. Challenge is open to all quilt artists; international entries are welcome. All entries must have been completed after January 1, 2015. Entry must consist of at least 2 layers and held together by some form of stitching, whether by hand or machine. Entry, which includes 2- & 3-dimensional work, must be a minimum of 18" on any one side / maximum of 90" on any one side. Item not to exceed 10 pounds. Entry must have a 4" finished sleeve attached to the full width of the top edge of the quilt, or an alternative installation method must be provided by the entrant, that is approved of by RMQM staff prior to submission. All entries must be clean, free of pet hair, smoke and odor. RMQM reserves the right to disqualify any entry that does not meet show criteria, exhibits poor quality construction, or has been misrepresented by the digital images. Entry must be available for the duration of the exhibition. Entries will be accepted electronically (email) between December 10, 2016 and February 28, 2017. Limit: three entries per person (each entry must be sent in separate emails). Entrants will be notified by March 8, 2017 if accepted. To submit, please follow the following instructions. Indicate if your entry is for sale and provide us with a price. A forty percent commission will be retained by RMQM upon sale of entry, which must remain on display for the duration of the exhibit. Entrants are responsible for shipment and insurance costs of entry while in transit to RMQM, 200 Violet Street, Unit 150, Golden, CO 80401. All return shipping and insurance fees will be paid by RMQM. For any questions regarding your submission, please email exhibits@rmqm.org.